Sabina held the dress up in front of herself and looked into the full-length mirror. Then she turned to me. “That’s nice,” I said. “It makes you look like Gena Rowlands.” Gena Rowlands? Sabina’s hair was much longer and pulled back into a pony tail. The shop we were in consisted of three rooms, sort of large walk-in closets. There were no salespeople in sight. I don’t remember if Sabina bought the dress. She is real, but the rest was a dream. When I told her friend Lee about it, she said Sabina was supposed to be shopping for a dress for a wedding next month. So I described the dream dress in as much detail as I could. Now Sabina’s trying to find this dress that will make her look like Gena Rowlands. As for me, I’m trying to find the man who wandered into Sabina’s kitchen while I was sitting alone at her table after our shopping expedition. His hair was full and dark, his skin a light olive. He was wearing a white long-sleeved shirt and dark pants. He sat down across the table from me and started speaking in a low-friendly voice. I was preoccupied and kept asking him to repeat himself. He told me his name was Roy Walli and even spelled it: W-A-L-L-I. He said he liked jazz and played the oud. When I related this scene to a musician friend, he told me the oud is a lute-shaped Arabic instrument and that playing jazz on it would be difficult but not impossible. After a short time, Roy got up to go. He apologized, saying he hadn’t meant to bother me. Suddenly, I didn’t want him to leave and protested that he wasn’t bothering me at all. He didn’t appear to believe me. After he left, I drank some white wine through a straw from an oversized goblet. Then I tried to look him up in the phone book. It had an unusually large number of sections, but his name wasn’t in any of them. Later, looking through a second-story window, I saw his name on an old-fashioned sign—the kind an auto repair shop might have—on a red brick building. It felt like a dead end. Saturday was the night of the full moon. I didn’t sleep very well. My stomach was churning, my heart was pounding, and my head ached vaguely. I seemed to wake up every half hour. Deep in the middle of the night, I found myself in an unfamiliar large two-story wooden house. I was looking through another second-story window watching the full-moon rise. My friend was asleep, but I called him over to the window to track the huge luminous moon’s ascent behind two distant hills. He wasn’t much interested in the moon and went back to bed. I continued to stare out the window, maybe a little hypnotized. As the moon rose, it seemed to grow larger instead of smaller, and to cast more and more light. All at once, it was huge and glowing, and I could see splotches of color and texture: mauves and blues and purples stood out against the pearly white ground. A large round white cloud served as a gauzy backdrop behind it. The moon cast so much light that far-away planets became visible. Everything outside the window took on the surreal appearance of a charcoal sketch. Nothing was in color anymore, and none of the normal daytime landscape was visible. Jupiter, trailing some kind of vapor, and Saturn and its rings were so close I could almost stretch out my arm and touch them. I was awestruck, but the thought I might be the only one seeing it made me feel very isolated and deeply disturbed. I had a sense of all these huge planets, including the earth, floating in space with nothing to anchor them. It was disorienting and frightening. I felt as if I really could fall off the edge of the Earth. Gradually, the moon rose higher in the sky, finally becoming smaller, its light dimming. The planets disappeared from sight and the world outside returned to normal. I must have stayed up all night because it was morning by then. My friend and I woke up around seven o’clock, talked a little, and made love. He got up, but I fell back asleep. When I woke up the second time, alone, I could still see the clear, grey outline of Jupiter in the sky, and that sense of floating freely in space, unanchored, wouldn’t go away. 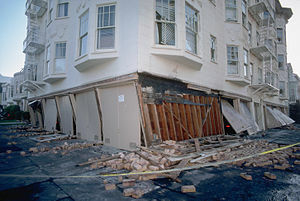 Yesterday, at four minutes after five o’clock in the afternoon, I was in Mill Valley, working alone at the far end of Sabina’s studio when the earth shook half a dozen marble slabs off the walls and sent them crashing down onto her desk and her paints and the floor. I don’t know where she was—maybe still looking for that dress. And I don’t know where Roy Walli was, either. Who was that guy, and just what was it he was trying to tell me that I was too preoccupied to hear? All I really got for sure was his name.